Who doesn’t love fall? The air changes from languid and slow to crisp and urgent. Dying leaves turn brilliant colors. There is something exciting about fall–or to use its more elegant name–autumn. These changing sassafras leaves remind me of one of Matisse’s playful cutouts. How rich and pretty the wood in this stack looks! This dead stump seems to be the life source for an impressive colony of brilliant yellow fungus. These leaves have fallen to the ground from the Balm of Gilead Poplar, a tree we love for its fragrance. The Los Angeles Times just stated officially that it will ban climate change deniers from its pages. In saying ‘no’ to false statements about climate change, one of the nation’s leading newspapers is setting itself apart from the rest of the pack. Most papers routinely report false statements about our changing climate, statements made by readers in letters to the editor, by fossil fuel industry representatives, by Koch Brothers-funded ‘experts,’ and others. These false statements, appearing regularly in publications across the country, help create a false impression in the minds of readers that denying the reality of climate change is a perfectly reasonable, defensible position. But it’s not. 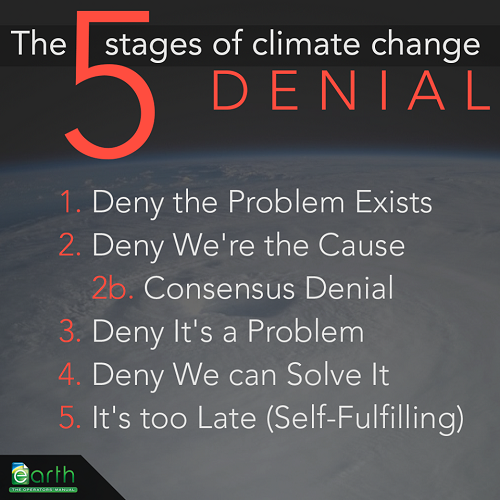 Climate change must be regarded as fact, not opinion, when 97% of climate scientists tell us it is real. I applaud The LA Times’s decision. At least one major U.S. newspaper is halting a practice that has caused a lot of harm. This practice has fueled a bogus debate, funded by the Koch Brothers, Exxon-Mobil, and other fossil fuel industry giants for their own financial interests. ”Such a debate, according to Thornton, “rather than shedding more light on the issue, leads to more confusion and obfuscation about the proven facts.” All at a time when, as a nation, we should be proceeding with all deliberate haste to wean ourselves from fossil fuels and adopt alternatives. and even the crimson cardinal grieves. the dark so long, so unforgiving. and the lands breed thick and luscious life. oh, do not let me go, not let me die. I have good news to report about Africa’s fragile mountain gorilla populations. These highly endangered animals, who have came close to going extinct as a result of human activity, are fighting back! In one of the two African reserves where the world’s remaining mountain gorillas live, a small group of juveniles were seen on a tracker monitor disabling snares set by poachers! Bush-meat hunters make thousands of snares every year, mainly to trap antelope, not gorillas. But some mountain gorillas do get trapped in the camouflaged rope-and-branch snares, which consist of a noose tied to a tree branch that has been bent to the ground and held taut with a heavy stone. And while adult gorillas are usually strong enough to free themselves, younger gorillas are often not so lucky. 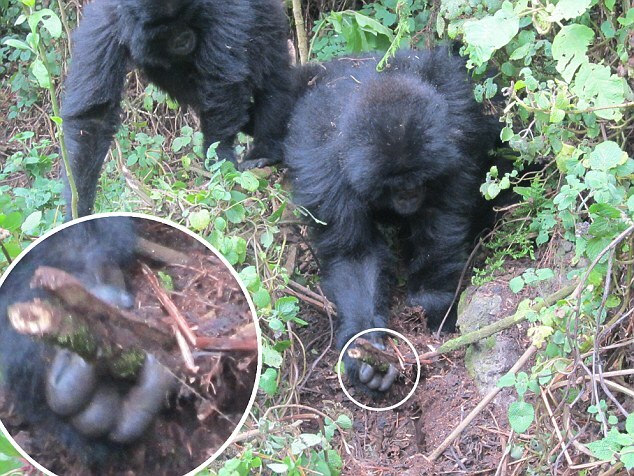 Just days after an infant gorilla died from wounds she received struggling to free herself from a trap, several young gorillas were observed on camera working together to break a poacher’s snare. One of the young gorillas jumped on top of the tree branch to loosen the rope, while the other ‘team members’ untied the knot! Then, spotting a second trap, the little team disabled that one as well. All this was observed on camera. I believe it is also impressive that these young animals organized themselves into an effective team to protect themselves and their fellows. I find it heartening that at least a few of these highly endangered animals have found a way to fight back against poaching, one of the major threats to their existence. Overall, the news about mountain gorillas is good. Their numbers are on the rise, increasing 10% between 2010 and 2012, from 786 animals to 880. ”The increase,” explains Drew McVey, species program manager at the World Wildlife Fund-United Kingdom, “is due to conservation efforts that have engaged the local community. We don’t just work with the animals in the national parks,” he explains, “but also with the people.” For example, McVey’s organization helps the people, who are very poor, to find alternative sources of energy, so that they don’t gather firewood in the gorillas’ already very small secure area. And fortunately, the local people value the gorillas, at least partly because of the tourist income they generate. While the recent growth in mountain gorillas’ population is encouraging, the fight to save them is far from over, according to McVey. In addition to the threat of entanglement in traps, the gorillas’ habitat is threatened by agriculture and livestock grazing. Another threat from humans is disease. Since our DNA is so similar to theirs, humans can transmit everything from the common cold to the ebola virus, according to Jessica Aldred, writing in THE GUARDIAN. And now there is a new threat–the prospect of oil exploration by petroleum companies in one of the two reserves. You are currently browsing the Earth Connection blog archives for October, 2013.